Waiting for the right time to bring it up… Delicate at best..
At the 2016 census, the Hamlet of Tuktoyaktuk had a population of 898, up 5.2% from the 2011 census total of 854. There are 283 private dwellings, and a population density of 64.1 inhabitants per square kilometre (166/sq mi). The average annual personal income in 2016 was $21,984 Canadian and the average family income was $55,424. Tuktoyaktuk has a large Protestant following, with a sizeable Catholic population as well. Local languages are Inuvialuktun and English. Tuktoyaktuk is predominately Inuit/Inuvialuit (79.7%) with 16.4% non-Aboriginal, 2.8% North American Indian and 1.1% Métis. 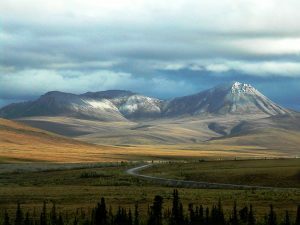 In 2012 the Government of the Northwest Territories reported that the population was 954 with an average yearly growth rate of -0.8 from 2001. Wikipedia, with a reminder to remember it’s volunteer-generated. It sounds like a temporary assignment to the Peace Corps. What will eventually happen, if you take enough spirit quests, is you start to feel like a total stranger at home. Then you’ve arrived. You might find this interesting. Backstory: Mowat wrote two books, at least, about being an infantry “left-tenant” in the Canadian Army in Italy in WWII: The Regiment and And No Birds Sang. Reading the below has put all that heartwrenchingness in perspective. I got my Mowat gig from my uncle who had a complex about Alaska when he was not being a college president. I sure hope she doesn’t look at this website. Looks like an amazing experience is waiting for you. Beautiful photograph!